Q: Where did the idea for Wall Street Noir come from? A: The idea for Wall Street Noir grew out of a view I’ve long held—based on nearly twenty years of working there—that Wall Street is actually quite a noir-ish place, a social crucible that is much more Jim Thompson than Warren Buffet. This runs contrary to many popular notions, I know, and to the public image—of a well-scrubbed, rational, even glamorous place—that the Street likes to project, but when you consider the big money, dysfunctional egos, cutthroat competition, class struggle, desperation, and sweaty paranoia that wash around there, it’s less of a stretch. My desire with this anthology was to collect stories that in one way or another illuminated the dark end of the Street. I was looking not so much for tales of glitz, glamour and masters of the universe as I was stories about desperate measures in pursuit of that glitz, or the corrosive, distorting effects of proximity to so much excess, or self-deception, or the people who get ground up in the well-oiled gears, or deals with the devil. I’d admired Akashic’s crime fiction list, and thought its Noir series might be a great vehicle for what I had in mind. (Akashic publisher) Johnny Temple and I had a talk, and happily he agreed. 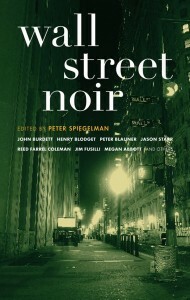 Q: You say in the introduction to Wall Street Noir that Wall Street has long been a crime scene. Why do you think that is? A: In this day and age—post-Enron, post-Adelphia, post endless insider-trading and conflict of interest cases—it’s hardly breaking news that there’s crime on Wall Street. Financial wrongdoing didn’t start there, of course, but it found fertile ground on the Street, and its roots run pretty deep. As to why—I’m not sure Wall Street criminals are ultimately so different from other varieties: they’re some combination of greedy, scared, desperate, and reckless. And of course there’s the fact that (to paraphrase Willie Sutton) Wall Street is where the money is. But I think there’s more to the story than inclination and proximity. Pressure is certainly a part of the Wall Street equation. People with P&L responsibility on the Street are under enormous pressure to generate revenue. Success can bring immense wealth, and failure can end careers. For some of these people, more than just run-of-the-mill avarice is at work. For them, money is merely a proxy for larger, more existential stakes. Failure doesn’t only put big bonuses at risk, but their sense of self as well. Corporate culture is another factor. Crime doesn’t occur in a vacuum—it’s encouraged (on Wall Street or any place else) when supervision is lax, and enforcement and penalties are perceived to be mild. Firms with slipshod controls, or whose managements focus on the generation of revenue to the exclusion of all else, often send ambiguous don’t ask, don’t tell signals to their employees, and tacit messages about what kind of behavior is and isn’t acceptable in the pursuit of profit. Q: Your contributors are an interesting mix: some veteran crime writers, some journalists, some Wall Street professionals, even a graphic novelist. Was this intentional? A: It was indeed. I wanted different perspectives on Wall Street—from both insiders and outsiders—and so the collection includes authors who’ve worked (or still work) on Wall Street, authors who’ve followed (or still follow) Wall Street for a living, and authors who’ve had no experience on the Street, but are interested observers. A varied bunch, but they all had great insight into the noir aspects of the place, and they all delivered great stories. Q: With such a varied group of authors, did any of the stories surprise you? A: I’m really very pleased with all of the stories, but a number of them did surprise me—in good ways, I’m happy to say. When the project started, I wouldn’t have predicted that the collection would include an historical story, but it turned out to have two of them (from Jim Fusilli and Megan Abbott). And while I had high hopes for the book’s graphic story (by Tim Broderick), the final product exceeded my expectations in terms of its immediacy, impact, and wit. More than anything, though, I was surprised by just how much humor (decidedly dark humor) some of these stories have. I expected dark and gritty, and I expected social commentary, but I didn’t expect funny. Q: Other volumes in Akashic’s Noir series focus on specific cities, and are organized by city neighborhoods; Wall Street Noir seems like something of a departure. A: I don’t think it’s a big departure. The books in the Noir series were conceived of as crime fiction travel guides to various cities, and Johnny Temple was appropriately insistent on maintaining that focus with Wall Street Noir. That made sense to me, as one of the things I wanted to explore was the fact that Wall Street has expanded far beyond its original roots, to become what is in effect a global city. So, consistent with the rest of the Noir series, Wall Street Noir is organized according to the “neighborhoods” of this virtual city. Those neighborhoods just happen to cover a lot of geography. Q: Is the collection aimed at Wall Street insiders, or can outsiders appreciate these stories as well? A: While Wall Street folks will certainly enjoy the “inside baseball” aspects of some of the pieces, the book is definitely not just for insiders. The collection will appeal to a pretty broad range of readers, I think, regardless of whether they know the difference between a stock and a bond.